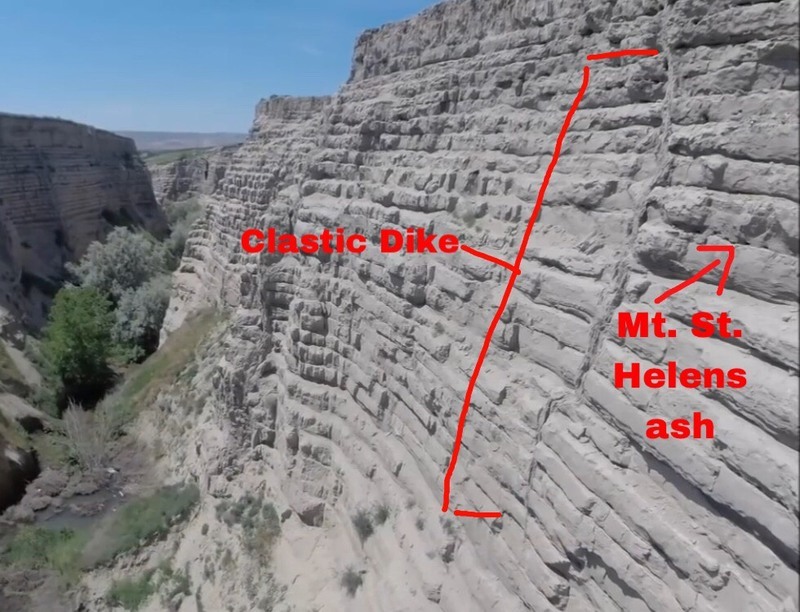 Deep in the heart of Lowden’s farming land is a canyon that has uncovered many mysteries around the Missoula Floods. Burlingame Canyon is over 1,500 feet long, and cuts down about 100 feet. 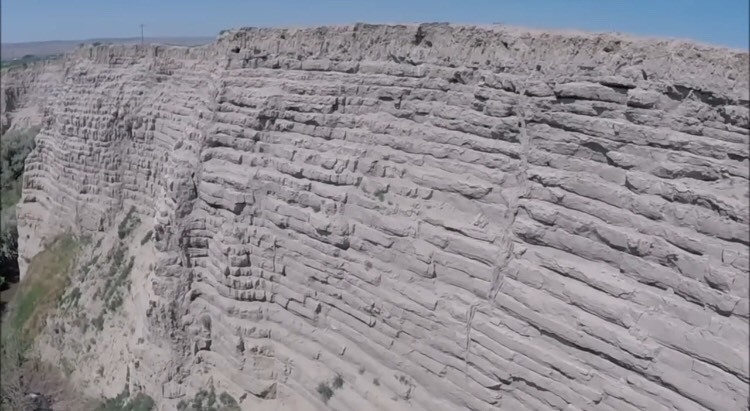 Not only is this canyon a visual wonder, it has played a key role in the multiple flood hypothesis. Burlingame Canyon might be hard to visit, as it is strictly off limits due to liability reasons, but many pictures and reports have been done. 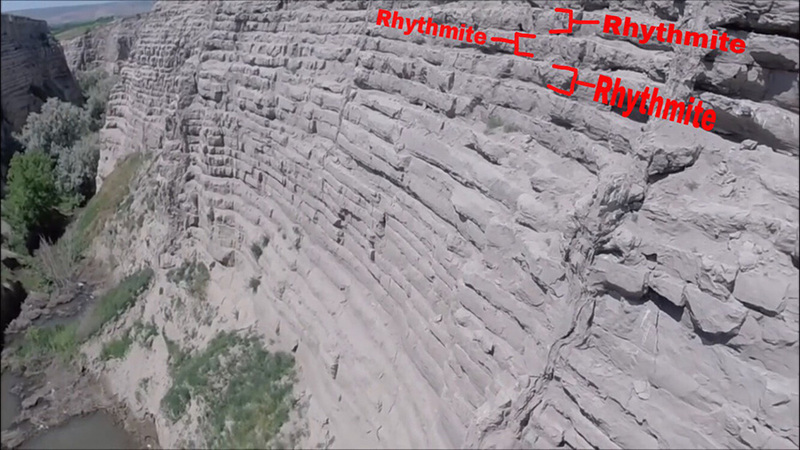 Bruce Bjornstad has taken his drone deep into the alfalfa fields to give the public a close up view on the canyon’s forty rhythmites. 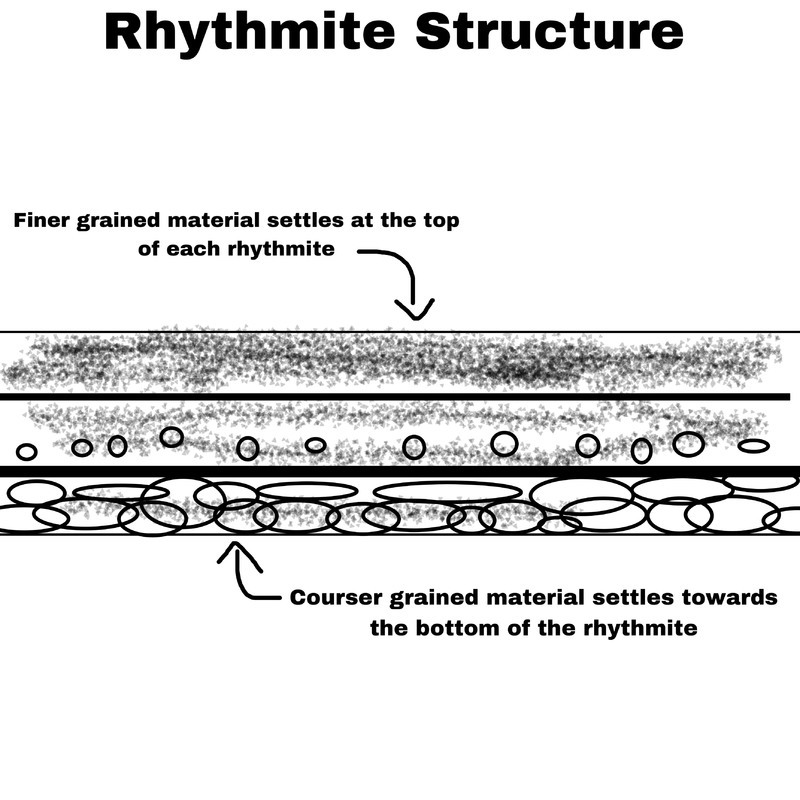 Rhythmites are layers of sediment that have obviously been deposited in a periodic fashion. Combined, all these layers are collectively known as the Touchet Beds, named after the small town of Touchet. These light layers of rock were exposed here due to a large irrigation pipe burst that took place over the span of just six days (Bjornstad, 2006). 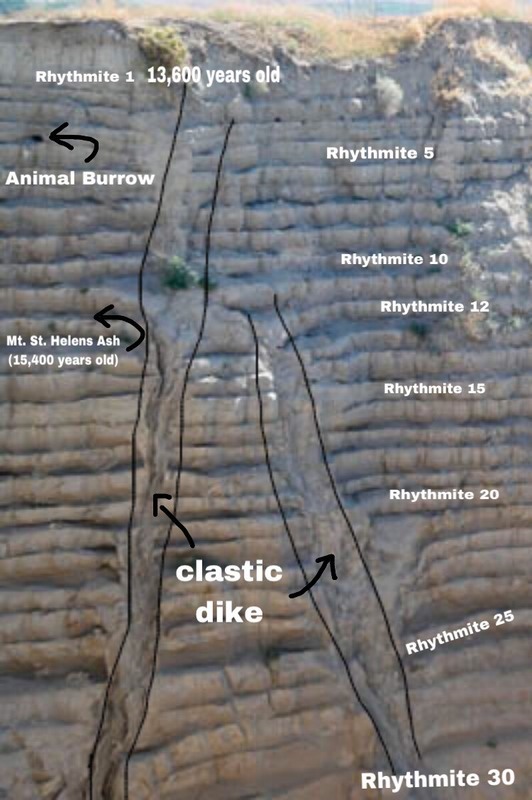 Differentiation of heavier, coarse grains can be seen at the bottom of each rhythmite, with finer grained sand towards the top of each layer (Fig. 1). Looking even closer into the layers will show different animal burrows, ash layers and clastic dikes (Fig. 2). These unique characteristics have continually supported the multiple flood hypothesis. In 1923, J Harlen Bretz stumbled upon this canyon while he traveled around Eastern Washington, studying what he called the “Scablands”. He believed that the Scablands were formed from multiple glacial floods that came from Glacial Lake Missoula (Bretz et al., 1956). After publishing his findings, Bretz received severe backlash from other geologist for supporting catastrophic flooding instead of the well-known uniformitarianism. 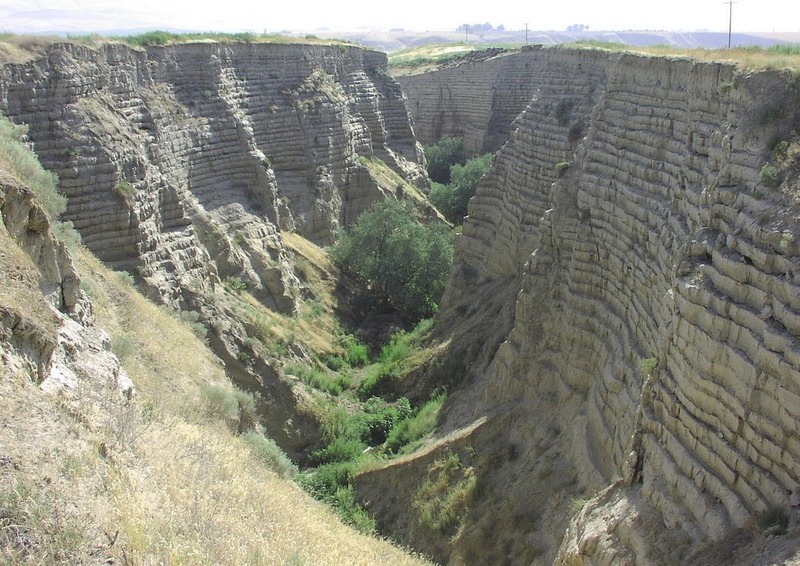 As the years went on and more research became available, Bretz was supported by more and more geologists as they used the Touchet Beds (exposed best at Burlingame Canyon, but can be seen in other places around Walla Walla) as evidence of multiple floods. Many scientists have helped collect evidence from the canyon but one of the most prominent was Richard Waitt. Waitt believed that each separate layer was an indication of an individual floods, known as jokulhlaups, that spilled from the breaking of the ice dam that held Glacial Lake Missoula (Waitt, 1986-99). Carbon dating of fossilized foliage and ash layers from Mt. St. Helens have shown that the beds to be about 16 thousand years old (Hanson and Clague, 2016; Baker et al., 2016). Between Waitt’s extensive research and Hanson’s dating, it has been widely confirmed that each rhythmite was only about twenty to thirty years apart. This means that floods washed over much of Eastern Washington for a few thousand years (Waitt, 1986-99). Burlingame Canyon may seem like an ordinary landmark at first glance, but once a person delves deep into the history, its importance becomes clear. This canyon is like a book, showing a multiplicity of history between its layers of pages. It has been major evidence in supporting the multiple flood hypothesis, while also being a breath-taking sight in the small town of Lowden. Chelsi Howard, “Burlingame Canyon Unlocks Missoula Flood Secrets,” Ice Age Floods Explorer, accessed April 21, 2019, http://floodexplorer.org/items/show/63.